If you follow anime at all, you've doubtlessly heard about Attack on Titan. It's the biggest release (on both sides of the Pacific) to hit store shelves in years. 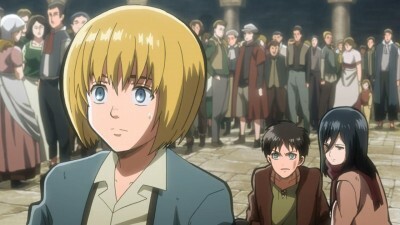 There's been an incredible amount of extremely positive buzz concerning the show, and all of the anime viewers here at DVD Talk were jockeying to cover it. So, is it as good as all of the hype? Pretty close. While it's not perfect it is an excellent show with a lot of action, intense suspense, and some shocking twists that keep viewers glued to the screen. It's been over 100 years since the Titans appeared and nearly wiped out mankind. No one knows where they came from, but they are incredibly deadly. Ranging from 10 to 50 feet tall they look just like large people (except for the fact that they have no genitalia) but they're mindless and they only eat one thing: humans. Titans regenerate at an incredible speed and are nearly unstoppable. Even decapitating them with a cannon shot only slows them down until they can regrow their head. The only way to kill one is to slice a section out of their neck, between the base of the skull and the nape, anything else is useless. While the plot sounds pretty simple and straight forward, this could easily be a mecha show with the plucky young protagonist vowing to become the best pilot ever, the show is anything but typical. 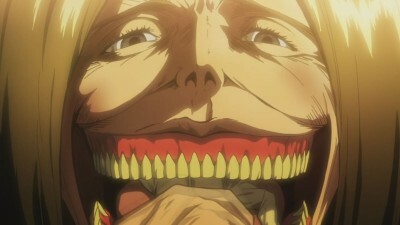 While the violence is dialed up a couple of notches (people are eaten after all, and while the camera cuts away just before the jaws snap, it's still pretty intense... seeing a screaming person being put into the mouth of a Titan is fairly common) that's not the thing that really sets this anime apart from all of the rest. There are a couple of aspects that work together to make this a standout show. First is the twisting plot. I won't reveal any spoilers in this review, but suffice to say that by the end of the second show, I knew exactly what was going to happen. I didn't know how it was going to come to pass, but I was confident that I could predict the major plot points that were going to occur. Except that I was wrong. There are a couple of events that really took me by surprise. Afterwards I readjusted by thinking and knew how the show was going to play out. And I was wrong again. I've been on the edge of my seat ever since. The program also gets kudos for not only showing the horrors of war, but the aftermath too and how the soldiers are affected. Many of the soldiers end up suffering from the psychological affects of what they've seen and it's not pretty. They crack up, they run away, and some just go catatonic. This really drives home how horrible the battles are (even after they have been shown) and makes the show all that more powerful. While I really enjoyed the program, it isn't perfect. The flaws are pretty minor though. The pacing is uneven at times and the first episode was actually a bit slow and had me wondering what all of the fuss was about. 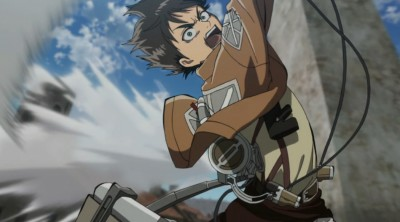 The other problem I had was with the design of the gear that the soldiers use to fight Titans. The steam-punk inspired, compressed gas powered, waist mounted, retractable grappling hooks and cables that allow the soldiers to swish through the city like Spider-man on his webs are a bit silly. Every time they were used I had to forcibly suspend my disbelief. It wasn't too hard, after all they are fighting mindless 40-foot giants. Unlike most anime releases, this set has some pretty decent bonuses included on the discs. 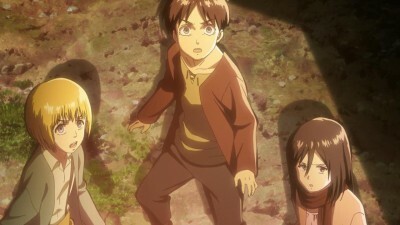 There are two commentary tracks, on the third episode with the English ADR Director Mike McFarland and English voice actors Bryce Papenbrook, Trina Nishimura and Josh Grelle and on episode 12 with Mike McFarland and actors J. Michael Tatum, Scott Freeman and Clifford Chapin. I'm not really a fan of commentary tracks on anime by the people who did the dub, but this one is there. 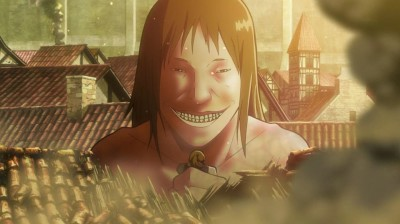 The thing that really surprised me was the nearly hour-long behind-the-scenes piece, The Making of Attack on Titan. Again, this dealt with the creation of FUNimation's dub track, but I found it fun and informative. Well worth watching even if you're not a fan of secondary language tracks. The best extra has to be Chibi Theater: Fly, Cadets, Fly! These shorts tell the adventures of the cadets in chibi form. 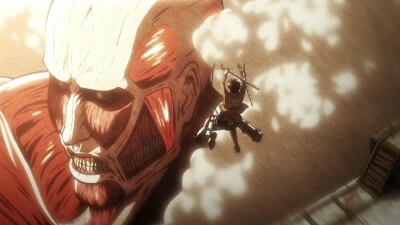 While I won't go so far as to say that Attack on Titan is the best anime ever, it is the best that I've seen in a while. Filled with some very frantic action, an intense story, and some truly surprising twists, it's a show that anime fans should not miss. Highly Recommended.